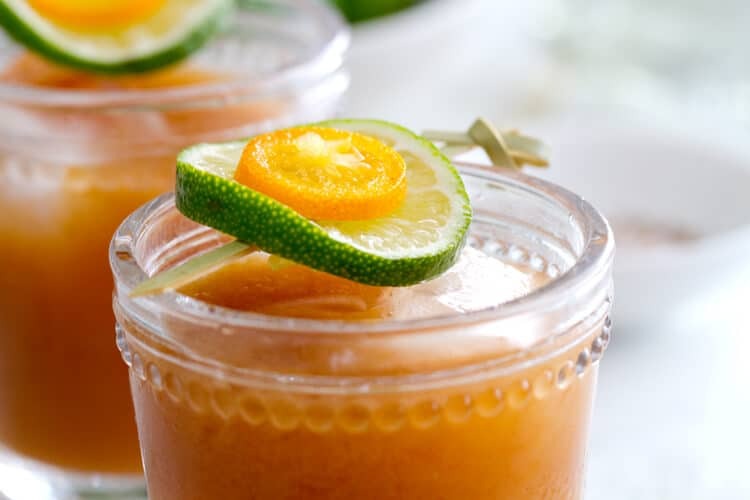 Sweet and tart, this refreshing tamarind drink is one you’ll want all summer long! In keeping with the festive nature of the day, I bring you my latest margarita obsession – the Tamarind Margarita Cocktail. If you’ve been reading this blog for a bit, you know how I feel about Margaritas! Whether it’s a classic Margarita on the Rocks, a Pomelo and Mint Margarita, Hibiscus Margarita or a Hatch Chile Margarita – I love them all! Well, except for the Tamarind Margarita Cocktails. Those made the whole experience definitely more bearable and this is now my favorite Tamarind drink recipe! But what is Tamarind and why would you want it in your Margarita? Because it’s absolutely delicious. Flavorwise, it’s similar to a traditional margarita… but better. The tamarind gives the cocktail a bit more body and a fuller and richer flavor and helps balance the sweet, tart and tequila flavors. In short, if you love margaritas you will love a Tamarind Margarita! Tamarind comes from the bean pod pulp of the tamarind tree which grows in India and Pakistan as well as other tropical climates. Sweet, with a distinctive tart flavor. What forms does Tamarind come in? You can buy tamarind pods and remove the pulp yourself. You can also buy blocks of pulp or concentrate which is ready to use. Where can you buy Tamarind? You can find it in Indian, Hispanic or Southeast Asian markets. You can also find it online! What do you use Tamarind in? Tamarind is used in Indian, Hispanic and Southeast Asian cooking and is used in everything from desserts to marinades, sauces, and curries. I used tamarind concentrate for this cocktail. The concentrate lasts a long time in the refrigerator and is a fantastic addition to meat marinades (it’s what gives Worcestershire sauce its tang) and makes an excellent dressing for Asian inspired salads. If you’re making it for a crowd, you can mix all the cocktail ingredients together ahead of time and then measure and shake right before serving! If you enjoyed this tamarind drink recipe, I would love for you to give it a 5 star rating!! 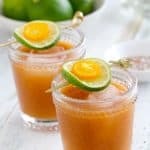 Flavored with tamarind concentrate, this tamarind margarita cocktail is sweet, tangy and perfect with chips, salsa and guacamole. Combine all the ingredients in a cocktail shaker, fill 3/4 full with ice and shake for 30 seconds. Strain over ice into a small tumbler, rimmed with salt if desired. Garnish with fresh lime slices and kumquat slices if desired. Hi Nancy! Wow, these look delicious and of course beautiful photos. We are such wine drinkers I don’t think I’ve ever even made margaritas at home, but this recipe could change that. I like Neera’s tamarind paste. It’s 100% fruit and no seeds, no sugar. So easy to use and what a terrific sour, tangy, sweet, interesting flavor. I use it in my homemade Hoisin sauce. Glad you are on the mend. 2 months of being ill is crummy and glad your kitchen is back up and running. Stay well and hope to see you soon. The perfect Chips and Salsa addition! Works great for all of those kid free parties! Cheers! I love margaritas! This one looks yummy! I could relax with a glass of it! Hi All! 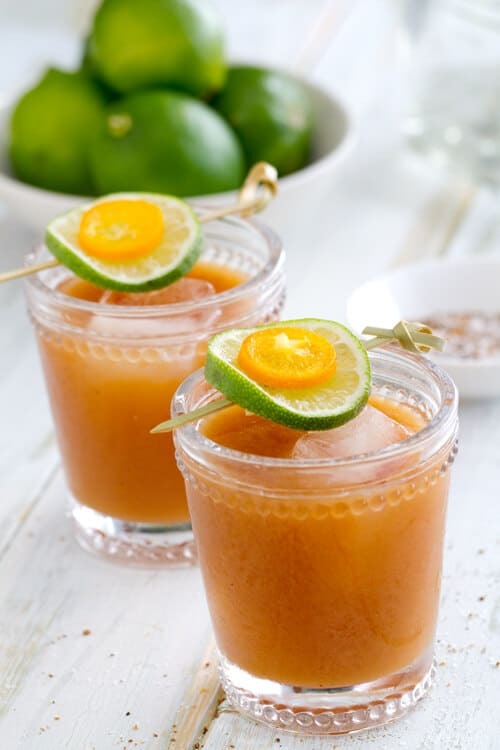 If you really want to step up your Tamarind Margarita… try infusing your Tequila with fresh jalapenos for a few days and then experiment with mixing a little pineapple juice or grapefruit juice into your Margarita. It really takes it to the next level! That is definitely on my list for the spring!! I know it’s going to be fantastic! !